Honky Tonks, Hymns & The Blues invites you to celebrate the life and music of WC Handy during Black History Month (February) 2007. From the producers of Honky Tonks comes WC Handy’s Blues, an hour-long special from PRI. Chock-full of Handy’s timeless music and interviews with music historians, musicians, and WC Handy himself, WC Handy’s Blues offers deep insight into the legendary composer of “St. Louis Blues.” Hosted by Sweet Honey in the Rock’s Ysaye Maria Barnwell. Find out more about WC Handy and WC Handy’s Blues. Click here to listen to complete interviews and download pictures. Enter your email address above to receive news about Honky Tonks, Hymns, & the Blues. In 2003, NPR's Paul Brown opened the dance hall door with two foot-tapping, smile-on-your-face Honky Tonks, Hymns & the Blues specials--featuring legendary musicians like the Carter Family, and the story behind the sound. Developed from the acclaimed Morning Edition (TM) segments, the two hours were self-contained and designed for summer programming--back to back or on two separate occasions. Click here to read more about our 2005 summer specials--or read on below to learn more about the original series on Morning Edition™. Major funding for production of Honky Tonks, Hymns & the Blues comes from the National Endowment for the Humanities. Additional support from the National Endowment for the Arts, the Texas Council for the Humanities, the Alabama State Council on the Arts, Rounder Records, the Institute of Texan Cultures at the University of Texas - San Antonio. Additional assistance from Texas Public Radio, the National Council for Traditional Arts, the Texas Heritage Music Foundation, and NPR Online. Each Friday from 07/4/03 to 09/12/03, Honky Tonks, Hymns and the Blues invoked American musical traditions on NPR's Morning Edition. These country sounds are the building blocks of America's popular music. The weekly Honky Tonks segments explored the roots music with historic performances, rare archive tape, and interviews with artists including country legend Merle Haggard, bluesmen Honeyboy Edwards and Taj Mahal, and fiddle greats Alison Krauss and Mark O'Connor. Click here for our collector's page. can hear Honky Tonks, Hymns, & the Blues in your area. What's a Honky Tonk Anyway? The origin of "honky-tonk" is unknown, according to Merriam-Webster. But The New York Times' Ed Boland reports "... many musicians say the term, which can mean a type of ragtime music or a tawdry nightclub, stems from Tin Pan Alley. In the early 1900's, every music production company had a piano in the office, and from the street you could hear people banging away. Many of these pianos were made by William Tonk & Brothers at 10th Avenue and 35th Street. The pianos and the sounds they made soon became known as honky tonk." Honky tonks sprang up around east Texas oil fields in the 1930s as places for hard-drinking, tough-talking men to get loose after a long day’s work. Hank Williams’ country hit “Honky Tonkin” could have been their theme song. But, in 1952 country singer Kitty Wells looked like somebody’s aunt when she debuted, "It Wasn't God Who Made Honky Tonk Angels". Wearing a lady-like gingham dress, but daring to sing about adultery and divorce from a woman’s point of view, she captured the nation's attention and started a revolution in country music. Interviews include performers Pam Tillis and Jean Shepard and the music of Kitty Wells, Hank Thompson and Pam Tillis. Production by David C. Barnett. Cowboy hats and guitars symbolize ‘Country Music’ today, but a hundred years ago you wouldn’t have heard much guitar picking on the porches of rural America. The banjo and fiddle were the primary voices of early American roots music; the guitar was a plaything of the rich and elite. It wasn’t until the late 1880s that guitars gained popularity, as a parlor instrument played by women. Fueled by mass-production and mail-order catalogs, guitars became a staple that slowly moved into the mainstream. But, the parlor roots ran deep: all the early country guitarists said they learned guitar style from a mother. So it’s no surprise that “Mother” Maybelle Carter would be one of the first innovators of the ‘Country’ guitar. The segment features the archive interviews and music of Maybelle Carter and Etta Baker. Production by Tom Cole and Jesse Boggs. There may be far fewer Sunday churchgoers than a generation ago, but millions of Americans have been drawn to rural southern gospel music through the popular soundtrack of the film, O Brother Where Art Thou. Concert tours and ‘follow-up’ albums have found audiences eager to buy traditional songs about “old-time religion”. Is this just musical fashion or does their moral message resonate with today’s audiences? Interviews include Charlie Louvin and Grammy ® winner Ricky Skaggs and music by the Louvin Brothers, Alison Krauss and Gillian Welch. Production by David C. Barnett. ‘Barrelhouse Tommy’ was famous for raunchy records he made in the 1920s. Thomas A. Dorsey wrote “Precious Lord”, one of the most popular and powerful hymns of all time. Both styles came from the same man at opposite poles of his life. Dorsey combined sacred lyrics and secular style in a new kind of church music. His American black gospel was a musical revolution. We hear from gospel artist Walter Hawkins, and the music of Thomas Dorsey as sung by Kansas City Kitty, Mahalia Jackson, and Elvis Presley. Production by Jacquie Gales Webb. In the first third of the 20th century, these itinerant singers played in Delta juke joints, on street corners in Texas’ big cities, and on railroad platforms in dusty Alabama towns. They had colorful names like “Blind Lemon” Jefferson, “Mississippi John” Hurt and “Leadbelly” --or simple ones like Robert Johnson and Charley Patton. The lines of their guitars etched the foundation of rock and roll. They wrote songs about the devil, women and jail, and harnessed them to earthy music that could lift the spirit. Just what makes a song a blues? Is it a feeling, a musical form, or a way of looking at life? Interviews with Honeyboy Edwards, Son House and Taj Mahal; Music by Charley Patton, Son House and Bukka White. Production by Tom Cole, Barrett Golding, and Larry Massett. 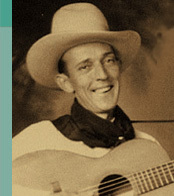 What we call country songs today, three minute tales of faithless love, restless traveling or sentimental ballads about “momma,” owe a part of their heritage to the old mountain ballads and one part to the phonograph records that made an icon of Jimmie Rodgers. In a life as colorful as the songs he sang, the "father of country music," rose from obscurity to create a new level of international stardom for American music. Interviews with Merle Haggard and the only living person to have played with Jimmie Rodgers, Hoyt 'Slim' Bryant; music of Gene Austin and Jimmie Rodgers. Production by Jesse Boggs and David C. Barnett. Bob Wills, King of Western Swing, in a publicity photograph from the late 1940s. They would do anything to escape the relentless sun and bone- wearying work of the Alabama cotton fields. Offered a chance to sing on radio, the Maddox Brothers and their 12-year old sister, Rose, jumped into that new medium. For four decades their talent, humor and brilliant synthesis of popular and traditional music captured the imagination of hard-working people across America. Interviews with Don Maddox and Emmylou Harris; music of the Maddox Brothers and Rose. Production by Paul Brown with Leda Hartman. Listen to Part 8 . Like a butterfly, the small and light violin came to America with early colonists. It went from musical culture to culture, and it carried their elements like pollen. Circuit-riding preachers, peddlers and schoolteachers all spread their tunes and styles to the most isolated areas. Even in the deepest rural hamlet, a fiddler was never alone. Then these sounds were amplified by talking machines and radio to become powerful agents of change in disparate musical styles. Lately they have reappeared as popular music with the success of the film O Brother Were Art Thou and its traditional music soundtrack. Modern fiddlers Mark O’Connor and Alison Krauss help tell the story with music by them Eck Robertson, and others. Production by David C. Barnett. FAs sharecroppers working in Texas cotton camps, Bob Wills’ family supplemented their meager income by playing for dances. Their music reflected the diverse population of the Southwest -- with German polkas, and waltzes, Spanish guitar and violins, and bits of blues and jazz from the black sharecroppers that they had worked beside in the fields. As young workers left the farms and ranches for the more lucrative oilfields a new music was heard from the raucous roadhouses where they spent their pay. Combining old-time dance music with jazz, Bob Wills created Western Swing. This segment includes Wills own recollections, “Asleep at the Wheel’s” Ray Benson and music by Wills and Martie Seidel and more. Production by David C. Barnett. For more than half of the 20th century, segregation was the law in parts of America. But musicians rarely let race get in the way of making good music. The evidence in commercial recordings and in the stories of musicians is undeniable. Black and white players inspired and influenced each other, creating a common, musical culture though sometimes underground musical culture. This final segment of Honky Tonks Hymns and the Blues explores the crossovers of style and content, the “race records” that brought black music to all of America, and the racial divisions that remain in the music industry today. Interviews with Doug Wamble, Clarence "Gatemouth" Brown, and Stax Records’ Memphis studio musicians; and the music of Lesley Riddle and the Carter Family. Production by Leda Hartmann. The Carter Family has a legendary place in country music. Their songs, and the image of a family band playing wholesome music, have influenced countless of younger musicians who still play their repertoire. This story will explain how the powerful border radio stations of the 1930s and ‘40s, located in Mexico, first helped spread the family’s parlor-style country music to a mass audience. We’ll also hear from Janette Carter, who runs the Carter Fold in southwestern Virginia. Production by Heath Curdts.